First and foremost, I thanked you whoever joined my lunch invitation at Eid yesterday. Every eid, I usually cook a special menu that I barely make. This eid ul-fitr, I made Lontong Sayur Padang. It’s supposed to be Ketupat Sayur Padang, but I don’t have the access for the wrapping ingredient. Ketupat and lontong are very similar. Both are rice cakes and made from rice; the only different is the wrapping material. 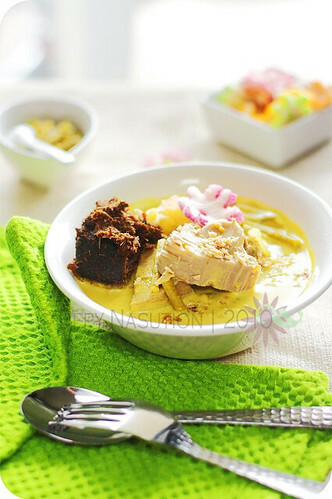 While ketupat is wrapped in janur (young palm leaves), lontong is wrapped banana leaves. In Indonesia, mostly the janurs are from 3 different palm leaves, coconut, sago palm (rumbia) and arenga palm (aren). I also served Lumpia Semarang (Semarang style spring rolls) as appetizer and Le Boh Timon/Es Timun (Acehnese cucumber limeade) as beverage and reducing the cholesterol from the food :). Eid doesn’t feel complete without Indonesian cookies such as nastar (pineapple filled cookies), sago cookies etc. Hence, I only made one type of cookies, Duri Duriang (durian filled cookies). My theme for this eid is nusantara. At least, I was covering 3 islands, Sumatra with Lontong Sayur Padang and Le Boh Timon, Java with Lumpia Semarang and Sulawesi with duri duriang. Reminder: There are still time for participating at CSN Giveaway. Sounds delicious, Pepy! Just so you know, the image from Flickr is not coming through when I view this page but I saw your photos on Flickr earlier luckily. Thank you for letting me know. I changed the link already. I really wish that I can come to your house to enjoy all the food you cooked. Looks so delicious!! Je sais où aller maintenant pour des recettes indonésiennes. Bonne fête de l'Aïd el fitr et à bientôt. I haven't had lontong for ages…! Looks delish as usual…!! You cooked those all by yourself without any help? Wow you are one amazing woman! I had no idea that there are different types of ketupat wrappers. This is something completely new to me…it looks so tempting! Lovely! I like lontong, love the gravy on my rice. I would have loved to have celebrated Eid with you! All of the food you describe sounds fantastic and it's all so new to me! Thanks for opening my eyes to all these tasty things. A supüerb Eid dish! So colorful and delicious looking! Wish I could send some of my ketupats your way! These Raya dishes look fabulous, Pepy. Your guests were so lucky to have tasted them! Happy Eid!